Melvin Joe Daniels (July 20, 1944 – October 30, 2015) was an American professional basketball player. He played in the American Basketball Association (ABA) for the Minnesota Muskies, Indiana Pacers, and Memphis Sounds, and in the National Basketball Association for the New York Nets. Daniels was a two-time ABA Most Valuable Player and a seven-time ABA All-Star. He was enshrined in the Naismith Memorial Basketball Hall of Fame in 2012. Daniels attended Pershing High School in Detroit, Michigan, which also produced players like Spencer Haywood, Ralph Simpson, Kevin Willis and Steve Smith. Daniels then played for the University of New Mexico Lobos basketball team, where he averaged 20 points per game and was named an all-American. Daniels was the ninth pick of the 1967 NBA draft, selected by the Cincinnati Royals, and was also drafted by the Minnesota Muskies of the American Basketball Association (ABA). He chose to play in the fledgling ABA. Daniels was the ABA Rookie of the Year for the 1967–68 season before being traded to the Indiana Pacers, then of the ABA and now in the NBA. Daniels was the ABA Most Valuable Player in both 1969 and 1971 and led the Pacers to three ABA championships in 1970, 1972 and 1973. Daniels played in seven ABA All-Star Games, and was named the ABA All-Star Game MVP in the 1971 game. 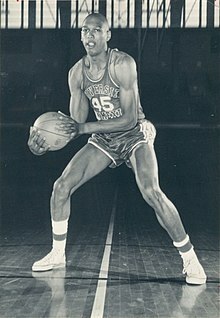 Daniels led the ABA in rebounding average in three different seasons, is the ABA's all-time leader in total rebounds (9,494) and second in ABA career average rebounds per game (15.12) behind Artis Gilmore of the Kentucky Colonels (17.07). Daniels had 1,608 career postseason rebounds. Daniels played briefly for the NBA's New York Nets during the 1976–77 season. Overall, in his ABA/NBA career, Daniels averaged a double-double of 18.4 points and 14.9 rebounds in 639 career games. After retiring as a player, Daniels joined the coaching staff of his college coach, Bob King, at Indiana State. There he coached future Hall of Famer Larry Bird. Daniels joined the Indiana Pacers front office in 1986 and was the team's Director of Player Personnel until October 2009. Daniels died on October 30, 2015, at the age of 71, from complications after heart surgery. He was survived by his wife, CeCe Daniels, son Mel Daniels Jr., two granddaughters, and two sisters. Daniels was inducted into the Naismith Memorial Basketball Hall of Fame in Springfield, Massachusetts in 2012. He formally joined former ABA players Connie Hawkins (1992), Dan Issel (1993), David Thompson (1996) and Artis Gilmore (2011) in the Hall on September 7, 2012. In 1997, Daniels was selected as a member of the ABA All-Time Team by a panel of ABA sports media, referees and executives. Daniels' jersey (#34) is retired by the Pacers. He is one of four players (the others are Roger Brown, Reggie Miller and George McGinnis) to have his jersey retired by the Pacers. ^ SI Wire. "Mel Daniels: Pacers star and Hall of Famer dies at age 71 – NBA – SI.com". SI.com. Retrieved October 31, 2015. ^ The Official NBA Basketball Encyclopedia. Villard Books. 1994. p. 240. ISBN 0-679-43293-0. ^ The Official NBA Basketball Encyclopedia. Villard Books. 1994. p. 209. ISBN 0-679-43293-0. ^ "20 Second Timeout". 20secondtimeout.blogspot.com. Retrieved October 31, 2015. ^ "Mel Daniels Stats". Basketball-Reference.com. ^ Wells, Mike (October 23, 2009). "Pacers fire Mel Daniels". Indianapolis Star. Archived from the original on November 26, 2009. Retrieved October 31, 2015. (Subscription required (help)). ^ Mark Smith. "Lobo hoops legend Mel Daniels dies at age 71". Albuquerque Journal. Retrieved October 30, 2015. ^ "Mel Daniels dies at age 71". ESPN.com. Retrieved October 30, 2015. ^ "Five Direct-Elects for the Class of 2012 Announced By the Naismith Memorial Basketball Hall of Fame" (Press release). Naismith Memorial Basketball Hall of Fame. February 24, 2012. Archived from the original on March 14, 2012. Retrieved February 24, 2012. This page was last edited on 11 April 2019, at 01:10 (UTC).